Mocha Pro is a planar tracking and roto application featuring advanced modules for Object Removal, 3D Camera, Stabilization, and Lens Correction. The Boris FX Mocha Pro 2019 Plug-In for Avid gives you the flexibility to use Mocha right from within Avid Media Composer. A minimum purchase of five floating subscription licenses is required. The Mocha Pro 2019 Plug-In for Avid can be used in a stereoscopic workflow in the host application but doesn't offer any independent stereoscopic tools. Also, the plug-in uses the host application's media engine and project format, thereby reducing the need for transcoding or external file management. Mocha's powerful masking tools are improved with 4 new spline tools to speed up shape creation and save time on roto projects: Magnetic Spline Tool with edge snapping, Freehand Spline for fluid drawing, and New Ellipse and Rectangle Shapes. The updated interface makes Mocha easier to learn than ever before and looks great on hi-res and retina enabled monitors. The Mocha Essentials Workspace brings the power of Mocha to novice-level users with a simplified, elegant, and easy-to-learn interface. Tracking & masking is now faster by reducing complexity and focusing the Mocha interface on the most essential icons and tools. Switch to Classic for advanced modules and customize workspaces for flexibility. Mocha's Remove Module has been rewritten to optimize GPU video hardware for up to 4-5x render speed improvements on removals and clean plating projects. For high-resolution 4K projects and 360/VR video resolutions, the resulting speed improvement is a massive time saver. Mocha Pro 2019 now includes all of Mocha VR's features for mono/stereoscopic 360 effects and finishing such as stereo 360 planar tracking and masking, a unique spherical 360 workspace, horizon stabilization and reorient, new and improved GPU-accelerated object removal, as well as stereoscopic masking tools such as anaglyph view, L/H hero mode, and lens workflow for equirectangular to flattened conversions. 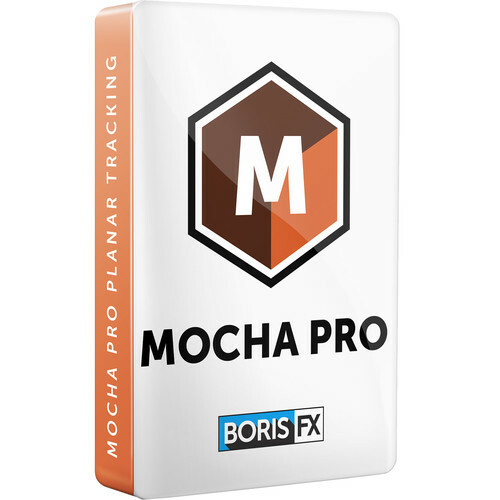 The renowned Mocha planar tracking has now been updated for speed and efficiency with GPU tracking and plug-in options. Planar tracking is at the heart of all Mocha Pro modules and is used to drive 2D and 3D tracking, roto-masking, object removal, and more. Unlimited tracking layers and advanced AdjustTrack interface can handle reflections, occlusions, noise, even in areas with motion blur or low details.